How to E-mailing printed documents, Help & Manual - ImagePrinter Pro. Options in this tab are provided for files delivery via e-mail right after printing. In order to activate these options, check Enable sending of files via e-mail item. 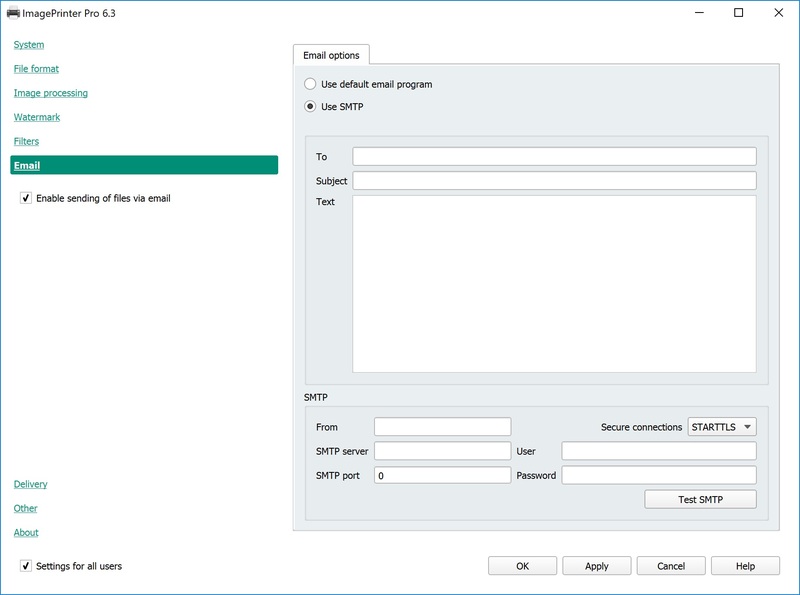 Use SMTP Email is delivered directly via your SMTP. You can specify recipient (To field), Subject of the message and its Text. In SMTP section basic SMTP settings must be specified: address, port, user name and password for e-mail delivery. If you do not know how to fill these fields, contact your system administrator. After specifying delivery options, you can test them. Press Test SMTP button and choose any image to send as test message with specified settings.